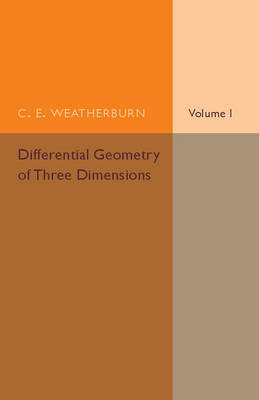 Originally published in 1927, as the first of a two-part set, this informative and systematically organised textbook, primarily aimed at university students, contains a vectorial treatment of geometry, reasoning that by the use of such vector methods, geometry is able to be 'both simplified and condensed'. Chapters I-XI discuss the more elementary parts of the subject, whilst the remainder is devoted to an exploration of the more complex differential invariants for a surface and their applications. Chapter titles include, 'Curves with torsion', 'Geodesics and geodesic parallels' and 'Triply orthogonal systems of surfaces'. Diagrams are included to supplement the text. Providing a detailed overview of the subject and forming a solid foundation for study of multidimensional differential geometry and the tensor calculus, this book will prove an invaluable reference work to scholars of mathematics as well as to anyone with an interest in the history of education.